This is a FAQ answer page for our urban owners - in regards to potty training, socialization, and being careful with their low immune systems in urban areas full of germs that could harm your puppy. Let me start with this warning - nothing is 100% safe! Puppies can easily get sick, and even an adult dog will get parasites or germs, or maybe even wounded at dog parks or beaches, or anywhere out and about. You can only do your best, while still providing a good training base and ongoing, cautiously fun adventures. As for walking outside, you will get a variety of opinions. Most vets in your area will tell you to keep him inside at least until his second round of shots. I guess parvo and lepto is prevalent in NYC/Hoboken because of the rats (and, of course, the crazies that don’t vaccinate their dogs). Even adult dogs will pick up roundworms and other parasites from the dog parks, or really just about anywhere - animals put things in their mouths - horses are wormed frequently and dogs should be too! Keep your puppy on monthly heartwormer preventative with parasite control baked into it (Interceptor is one such good brand) for their entire life. 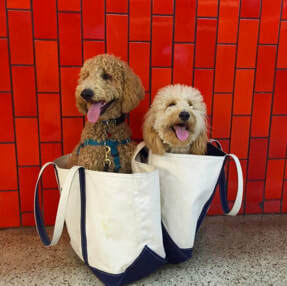 My recommendation is for at least the first two to three weeks, keep him in the tote bag (we provide one) when you go outside - this is great for socialization and once you teach him to stay in it (just keep one arm in it and also put treats - use the puppy food/kibble - on the bottom), it also is a "safe zone" for him to look around and hear the scary ambulances or subway noises without bolting. Put a hand sanitizer on the tote bag that I will give you (the kind with the rubber clip on it) and ask people to put it on before petting him. I used to tell people to go ahead and do whatever, but we did have 2 puppies in those first two litters get a cold and then pneumonia (in NYC) - so now I am much more cautious. Unfortunately, even if they don’t seem stressed, they are, because they are in a new place and don’t know who you are or where their siblings went. So their immune systems drop to nothing the first few weeks of going home with you. You can use a potty tray or wee pads for inside. You can also get a linoleum remnant for $26 or so at Home Depot or Lowes (this is what I do - for every litter, I use a new one - protects my floors) - I put the pen over the linoleum with the crate and the potty tray (or just wee pads), as well toys, etc. - I know it is not pretty to have in a home, but it is only temporary. Please note, you can do the "Litter pan" with pine pellets option, OR the potty tray. Sometimes they do better with the litter pellets because it smells like grass, but it is a little bit messy sometimes keeping the pellets in the litter pan (which is just an under the bed rubbermaid type thing). Take a look at the Shopping List for the litter options and the potty tray. Even after second vaccinations (they need at least 3 to 4 rounds), still be careful with being outside - no dog parks, beaches, etc. Wash paws and belly upon coming in (remove your shoes too) - carry him in straight to the sink. Some people use wipes or put sanitizer on a wipe - that’s all fine too. You can only do your best - and nothing is 100% perfect solution. Some worry about the training aspect of potty inside then train outside - these dogs are smart. It always takes awhile to potty train (months), but as long as you keep your expectations in check and don’t sweat doing some clean up, they ALL eventually learn to potty outside. Most will use a grate (like the ones on the trees or subway) because they think it resembles a potty tray - and all of them like the feel of soft grass to pee on. Some people in the city have use fake grass in the pen set up, and then when they were ready to go outside, they take the fake grass outside until the pup learns. Some put real grass sod on their balconies. Most puppies struggle learning to go on pavement - but, it’s amazing how they do adjust and learn. Another tip is to try to have a “spot” immediately near your outside door, so when it is storming, you can run out to that area and he will know to go quick by habit. But, on nice days, do not just rush him back inside after pottying or else he will not do it because you are ruining his fun always going right back in. And, of course, do not forget to reward, reward, reward - immediately when done pottying (or even during with your voice, "Good boy, good boy!"). 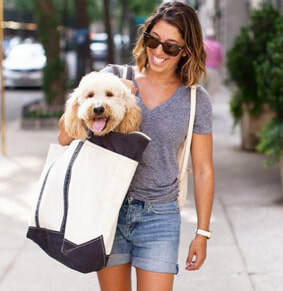 A note on socialization with the bag - your puppy might be scared of new people, or loud people, or loud kids - it is up to you to learn to recognize this and make sure he is properly rewarded (give a good piece of meat) when something or someone "scary" comes up. When an ambulance goes by being loud, try to give your puppy a little piece of meat. When a kid comes flying into the elevator on one of those skateboard scooter things, get your pup out of the way and reward him. Be quick about it. Dogs can become skittish if they are not properly introduced to things. You can also play music for your pup whenever you leave. Try to be creative and constantly think of ways to train your pup to be the best he can be. Hope that helps! The urban owners definitely have a lot more challenges with puppy raising - but, they most end up doing well because they are so dedicated, and I love that they take their dogs everywhere.